Did you know that a simple blacksmith mastered twenty foreign languages primarily because he valued every spare moment of his time? Discover the accomplishments of a highly motivated young man whose entrepreneurial spirit started a revolution in manufacturing and labor that has shaped modern-day industry. While some people simply give up when faced with seemingly overwhelming obstacles, these young men did not let difficulties stand in their way. 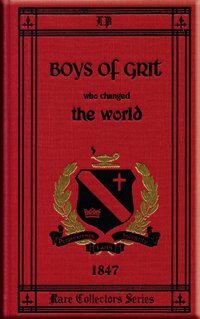 Boys of Grit Who Changed the World presents powerful examples of hope, perseverance, determination, and resolve through such influential men as Walter Scott, Robert Fulton, and Samuel Morse. From Richard Hall of Chesapeake, Virginia on 1/17/2018 . I started reading this book and could hardly put it down. I didn't know that Samuel Morse was a very accomplished artist!!!! I thought he just tapped out messages. It has provided us great inspiration and material for our history timeline in our homeschool! Highly recommend it!